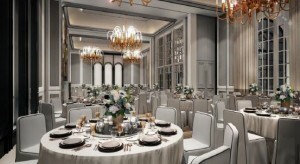 The St. Regis Singapore has unveiled a new event space. Converted from the hotel’s indoor tennis courts, the new space is known as Caroline’s Mansion, in honour of Caroline Astor – mother of St. Regis founder John Jacob Astor IV. Housing 370 square metres of lavish space, designed with original architecture elements from Caroline Astor’s New York home, Caroline’s Mansion boasts nine-metre double-height ceilings and a ballroom that can be divided into three intimate spaces. This innovative conversion of space started in March 2018 and took ten months to complete. Despite a tough economic climate, there has been increasing interest in high-end venues to host intimate weddings and events. The conversion of the tennis courts increases St. Regis’ space inventory and puts the hotel in an advantageous position to handle the demand for event venues.